Here we have a truly awesome Super Powers hardcopy. You can see the character is Wonder Woman and the piece is intricately hand painted. Hardcopies like this are hand cast from silicone molds made from the original wax sculpting. Examples are handpainted for use in catalog photography or used as paintmasters. The material used for this piece is a green urethane referred to as dynacast. 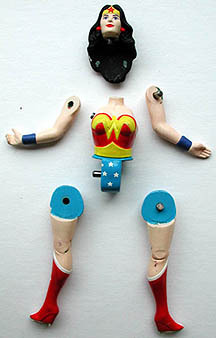 The limbs and head secure to the torso via metal pins. This is illustrated in the above photo.